Anyways, another year has gone by so fast. 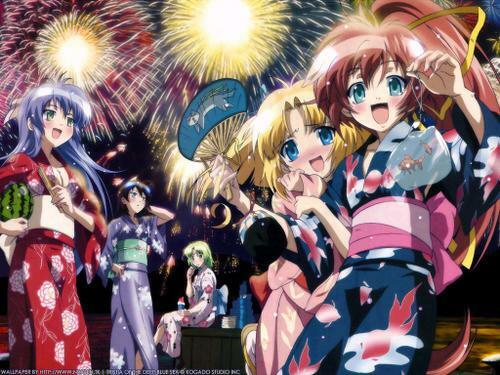 2010 was interesting, annoying at some times and definitely eventful in world news, anime news and heck, here at home. For x-mas we got ourselves a much needed upgrade in our computer systems... a Macbook Pro. I still have my nice dual screen PC set up in my anime-themed office, but this little tool was needed for a number of tasks that sadly my PC can't do. In particular, I needed the Mac to be an iPhone programmer. As of yesterday, I became one officially (after all the red tape, certificates, downloads, etc -_-) and I'm already testing and debugging practice programs on our iPhones. Android phones are not out of the question either. I have already been set up for android programming as well. Why does this even matter? Well, the next contest will have something to do with one of my apps in mind...so all those who made the Fumi, Yumi, Lily banners, be sure to stay tuned on that in 2011. 2011 will be the 9th year Chuck's Anime Shrine has been running and the 4th year for the anime store aspect of the site ^_^. I've seen some people have been coming directly to my store here on the site in addition to my branches on eBay, Amazon and Bonanza.com. Though I've been too busy to participate in the Danny Choo network.. I see some of you are coming here from figure.fm from testaments of my loyal customers. caught me by complete surprise and I'm absolutely humbled by the positive words I've been getting. I hope to continue that with the store part of the site into 2011 but to also reawaken older, non-store parts of this site in the coming new year. Let's also not forget the whole voice acting work I'm also into as well. In 2011 you might hear yours truley in a video game, anime or commerical (yeah...my life is full of side projects ^^;;). Commercials bring in good $ for voice actors but I so would love to be a part of a video game or anime too. Alright, enough about me and this site, how about you guys in the anime community? How was 2010 for you? Got any hopes, wishes, predictions for the coming year? Let me know in the comments below...and if I don't post anything tomorrow... Happy New Year ^_^.